SMITHFIELD, Va., Mar. 7, 2019 /3BL Media/ — Today, Smithfield Foods, Inc., Isle of Wight County Schools, and Isle of Wight County unveiled a new Career Building at Smithfield High School, consisting of classroom space and resources for five Career and Technology programs including manufacturing, engineering, welding, nursing, and the culinary arts. The newly renovated space, consisting of more than 21,000 square feet, is made possible through the Smithfield Foods Legacy Project, a $3 million donation to Isle of Wight County Schools to fund innovative and multifaceted education programs, benefiting both Smithfield High School and Windsor High School. 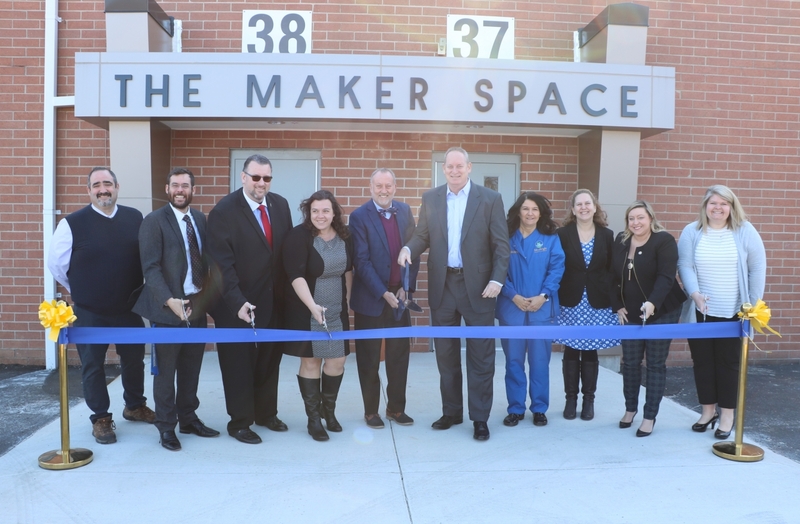 Manufacturing: The state-of-the-art MakerSpace classroom provides students with spacious worktables and access to 3-D printers, vinyl and laser cutters, and traditional wood working tools as they take ideas from concept, to prototype, to finished product. Engineering: The new Mechatronics laboratory offers space for students to engage in the engineering design process and project building. Welding: The new welding classroom features 20 welding stations that utilize industry-standard equipment to certify students based on the American Welding Society Requirement in arc welding and cutting processes. Culinary Arts: The space is outfitted with a commercialized kitchen with cutting-edge ovens, stove tops, mixers, and food prep area to provide a progressive culinary education, and includes a fully functioning restaurant run by students that will be open to the community. Nursing: This seven-bed area is outfitted with equipment to allow students to simulate patient care and prepare for the Nurse Aid certification exam. Innovation is part of Smithfield’s mission to produce “Good food. Responsibly.®” The Smithfield Foods Legacy Project reflects this value as well as Smithfield’s commitment to helping communities where its employees live, work, and raise their families. For more information about Smithfield’s commitment to its local communities, please visit smithfieldfoods.com/helpingcommunities. Smithfield Foods is a $15 billion global food company and the world's largest pork processor and hog producer. In the United States, the company is also the leader in numerous packaged meats categories with popular brands including Smithfield®, Eckrich®, Nathan’s Famous®, Farmland®, Armour®, Farmer John®, Kretschmar®, John Morrell®, Cook’s®, Gwaltney®, Carando®, Margherita®, Curly’s®, Healthy Ones®, Morliny®, Krakus®, and Berlinki®. Smithfield Foods is committed to providing good food in a responsible way and maintains robust animal care, community involvement, employee safety, environmental and food safety and quality programs. For more information, visit www.smithfieldfoods.com, and connect with us on Facebook, Twitter, LinkedIn, and Instagram. Isle of Wight County Schools dedicates its efforts to create a learning environment that will enable every child to discover his or her unique gifts and talents. Through this vision, Isle of Wight County Schools is committed to preparing approximately 5,500 students in all nine of its schools to be college, career, and life ready. For more information, visit www.iwcs.k12.va.us and follow us on Facebook and Twitter.